Eveline Jurry heeft de Methode Positief ScheidenTM (Positive Separation MethodTM) ontwikkeld en is een expert in het toepassen van praktische stappen om authentiek geluk en positiviteit te creëren wanneer het leven grote uitdagingen heeft. Haar eerste boek, ‘Je Wordt Weer Gelukkig’ (‘You Will be Happy Again’) werd uitgegeven door Bruna/Lev. in Nederland (2013). De Engelse vertaling hiervan ‘Happy Again! The Art of Positive Separation’ door Morgan JamesPublishers/New York (2018). Jurry traint en coacht individuen, professionals, bedrijven en overheden over de praktische toepasbaarheid van de kunst van positieve scheiden en hoe kwetsbare volwassenen empowered kunnen worden tijdens hun relatiebreuk of scheiding. Eveline woont momenteel in Amsterdam en Den Haag met haar partner en ‘blended’ familie van negen. People going through a divorce or separation have only one wish: to be happy again. ‘Happy Again! 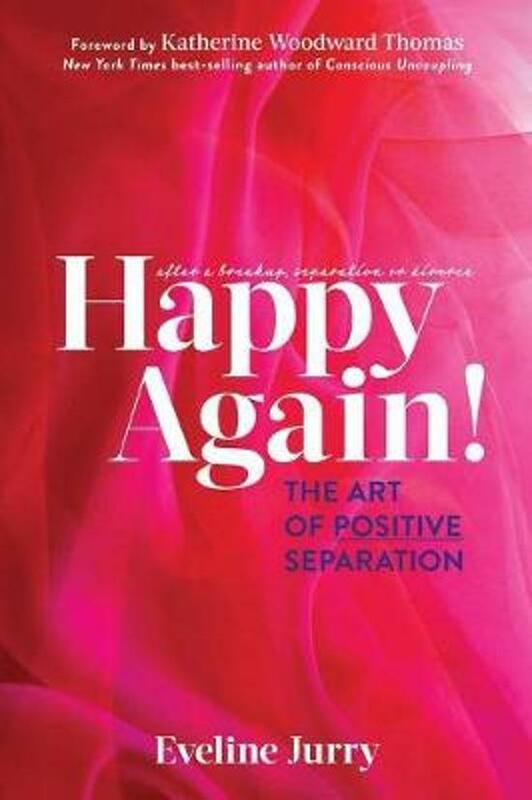 The Art of Positive Separation’ is a powerful, step-by-step guide that provides a blueprint for a brighter, happier, more fulfilling future after a breakup or divorce. It’s not enough for those going through a breakup or divorce to simply understand their emotions, reactions, and what caused their relationship to end. They need a plan and immediate, implementable action steps to move forward productively and consistently while in the midst of the chaos and pain of a separation. Happy Again! is the definitive handbook for those going through a separation to get their life back on track. Eveline Jurry’s proven Positive Separation Method™ provides a blueprint for disconnecting from the old life, and getting through each day with energy intact and a new, happy life in sight. Applicable to non-marital relationship breakups as well as divorces.